Information The game was indexed until 30.11.2012. 2.95 points at 21 votes (rank 854). In 1986 one could see the fantasy characters Connor MacLeod, Juan Sánchez Villa-Lobos Ramírez, Iman Fasil and Kurgan in spectacular sword fights on the movie screen. In the movie Highlander, which in the meantime has reached cult status, they fight about the Essence (the energy) that can only be received by beheading the opponent. The aim is to unite all powers of the immortals in oneself and with this to rule the world. Although the fantasy movie had not started very successfully at the beginning of 1986, the immortal sword fighters should however find their way to the home computer, in the shape of a fighting game. 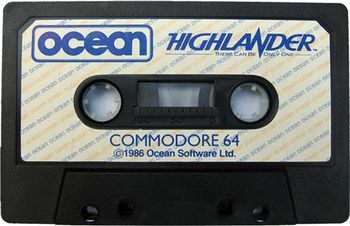 This games was realised by the software manufacturer Ocean Software. Battle through time, develop the skills of sword play and learn from Ramirez, your first opponent, the arts of defence and attack, timing and position. When you have defeated him move in time to the present and encounter Fasil, an ancient and more skillful opponent in modern day New York. Here you must hone your skills and sharpen your reactions for upon his demise you reach the final battle with the mighty Kurgen. High above the city streets on a deserted rooftop the last act of this deadly quest is fought. A dual which can only be won by supreme exponant. Green - enough energy, attack possible at any time. Yellow - you have lost vitality, be careful! Red - your reserve is dangerously low, take a break or flight to go on fighting later. To the left of the screen there is a sword visible, but it is only decoration. In the menu you hear the music piece from the soundtrack "It's a Kind of Magic" by Martin Galway. The level leads to the year 1541 and you learn the sword fight against Juan Sánchez Villa-Lobos Ramírez. The second fight carries us to the year 1985 and we fight against Iman Fasil in the underground car park of Madison Square Garden. In level 3 the showdown on the roof of the Silvercup Studios against Kurgan will take place. You can directly load the desired level, there is no need to win the previous fight. If you are outacted, some of the hits cannot be made any more. There is no special solution for this game, as each of the three parts can be loaded any time. As long as you do not get hit, the energy bar will regenerate. Only one attack is conducted per joystick movement. So first move the joystick into neutral position before doing the next attack. The fire button can be kept pressed. 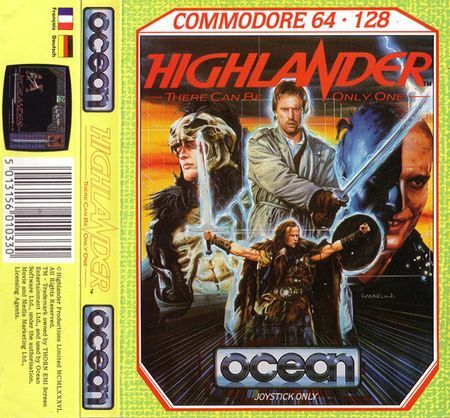 No cheats are known for Highlander. 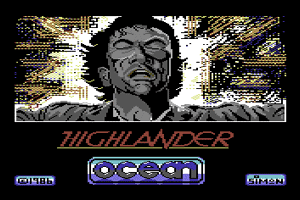 Wecky: "Highlander was my first game I bought blindly in Kaufhof and I believe it is one of the worst games you could buy. There is not more to be seen in this game than the three shown animations. The fighting is also very terrible and no fun. The only positive point is the music by Martin Galway. Therefore a clear favourite for the FLOP-100. I would give 0 points, but there is no 0 to pick, so I have to give 1 point." This page has been accessed 6,584 times.